Sunny Summer days call for a little extra pampering and protection to keep our skin looking it’s best. I’m always trying new skincare products and discovering favorites that make me wonder how I ever got through life without them. Today I’m sharing my latest and greatest in new-found skincare saviors that are perfect for this skin-challenging season. First up are my winners for facial care. I’ve been a big fan of Mad Hippie products for quite some time (hello, Exfoliating Serum) and the flower power of their products are the real deal. I’ve started using the Mad Hippie Vitamin C Serum at night before moisturizing and have been dabbing on Mad Hippie Eye Cream morning and night and love the way it gently softens fine lines and discoloration. My nighttime routine now includes Le Mieux Brightening Serum and I’m seeing a definite improvement in the smoothness and lightening of some of my stubborn sun spots from way too many years of getting way too much sun. Colorescience is a brand I’m already using (party time) but their new protective foundation is the holy grail of beauty meets skincare. I’ve found the perfect blend of light coverage and an all-physical SPF 30 protection in the Colorescience Tint du Soleil. The neck is an area that we can easily forget about but it’s one of those places that starts to show the early signs of a life lived in sunny climates so I’ve started paying extra attention to mine with Scalisi Skincare Advanced Wrinkle Cream. 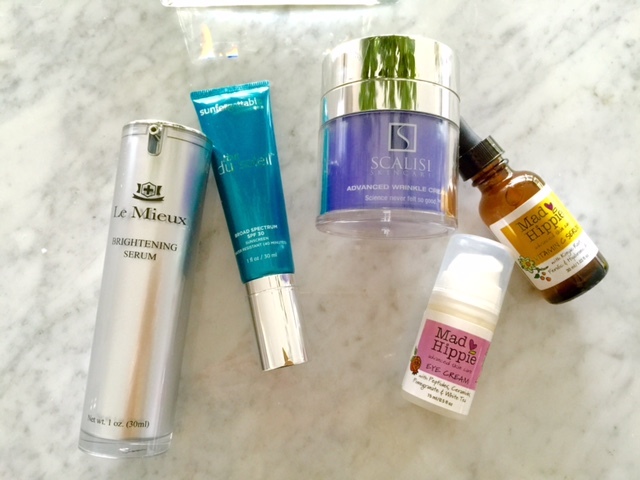 Free of Retinol and Parabens, the Scalisi Advanced Wrinkle Cream, which contains an injection-free peptide that acts as a topical botox, has a permanent home on my bedside table and has become part of my nighttime routine. 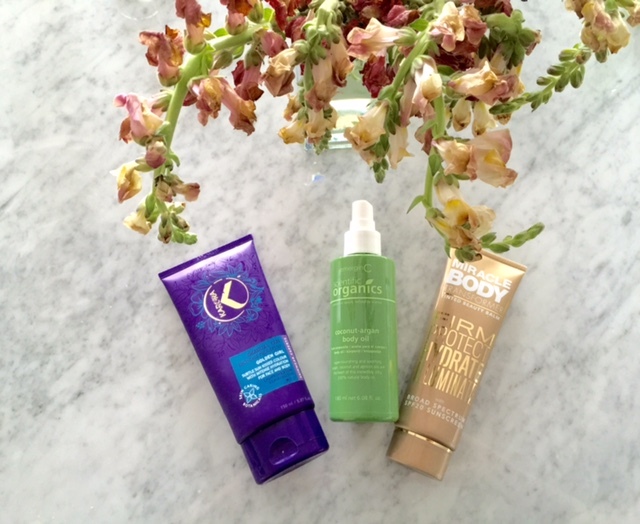 Three new-to-me body care treats have made my favorites list this Summer. I’ve used Karora tanning products in the past but the Karora Gradual Tan is what’s keeping me glowing this season. Infused with jojoba, coconut oil, rosemary leaf extract, vitamin E and essential oil of argan to soften, soothe and condition the skin, I can definitely see why Karora Gradual Tan is a beauty award winner. For those times when I need an extra boost of skin-smoothing color, softness and protection (not to mention how good it looks on camera) I reach for Miracle Skin Transformer for Body. Another newbie that I can’t believe I’ve lived without is emerginC’s Coconut-Argan Body Oil, a 100% natural body oil that softens, nourishes and calms skin. I’ve been using this coconut-argan oil to replenish my skin after a day of the elements; it does an excellent job as a soothing post-sun treatment and the natural botanical extracts help lock-in moisture. 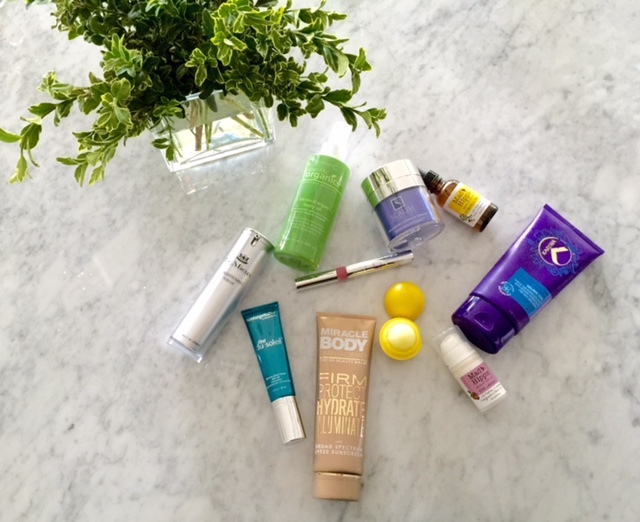 Last, but certainly not least, in my Summer skincare beauty round-up are my favorite new products for your perfect pucker. A well-hydrated pout is always a good thing and these two have been coming through for me winningly this season. 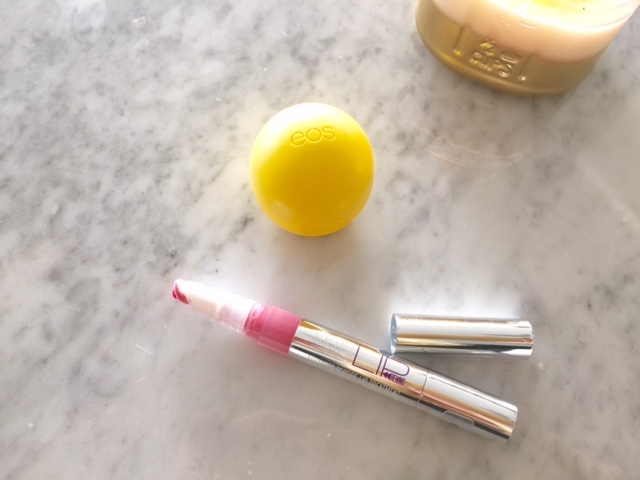 A little EOS ball is always in my bag and this smooth sphere lip balm in ‘Lemon Drop’ is perfection. Naturally flavored and PABA-free with a Broad Spectrum SPF 15 (water-resistant for 80 minutes! ), EOS makes this lip balm with Shea Butter, Jojoba Oil and Vitamin E to keep your lips soft, moist and sensationally smooth. For a bit of color along with protection and treatment, I’ve been using and loving Lip Rewind by Miracle Skin Transformer. Available in 4 shades plus Translucent, this anti-aging lip transforming serum-infused balm helps prevent daily damage, drying and moisture loss. I’ve got the Pink shade and love the cooling peppermint tingle and the way it makes my lips look softer and fuller with a noticeable reduction in fine lines.